In honor of the festival|! !| the bar team created the new Lemon Berry Two-Step cocktail. Served in a tall Collins glass over ice|! !| the utterly refreshing drink fuses tart and sweet with an enticing basil fragrance. Creole cowboys and cowgirls in starched jeans show off their sassiest Mamou two-step, Cajun jitterbug and zydeco slide during competitions at the annual Breaux Bridge Crawfish Festival, which attracts 30,000 visitors the first weekend in May. Considered the “crawfish capitol of the world,” Pont Breaux’s super-sized local crustaceans affirm the legend that their lobster ancestors crawled here from Canada long ago. A couple of hours before the bands get started in Parc Hardy at 10 a.m. on Saturday, locals will have been dancing up a storm at Buck & Johnny’s during the rollicking zydeco breakfast. By 8 a.m., the tables have been moved aside and folks are storming the dance floor, while knocking back stiff Stuffed Cajun Bloody Mary’s garnished with stuffed crawfish heads as lagniappe during the season. Popular for nightly live music, the intimate Filling Station bar and Cajun-Italian fare (try the creamy crab-portabella-brie soup and generous crawfish etouffée), Buck & Johnny’s introduced their new zydeco breakfast in January after Café des Amis (longtime host of the original Saturday morning zydeco breakfast that drew crowds to Breaux Bridge) announced it was closing for renovations last year. Muddle 3 basil leaves and 5 blueberries in 1 ounce of simple syrup. 2 ounces club soda and a splash of Sprite. 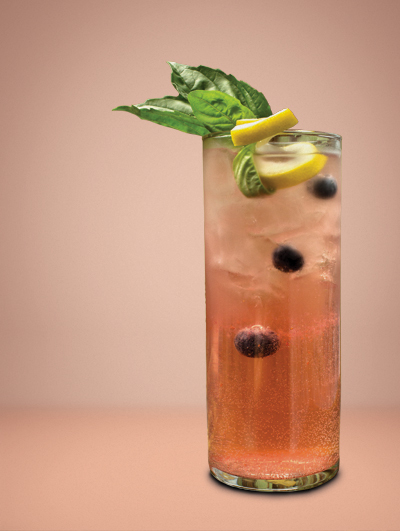 Garnish with fresh blueberries, basil and a lemon zest twist.